This simple, easy to wear poncho can be styled and draped many ways for any occasion. Dimensions: Laid flat: 56" x 64"
These are an important item for your wardrobe. Light weight and very comfortable. I love the fabric and the way it drapes. Thank you and looking forward to further colors. This poncho is beautiful. Cozy,comfortable and a beautiful turquoise color. Kerisma Knits provide the perfect mix of versatility and style. Made of a soft, lightweight wool blend, the knits make a lovely layering piece in any kind of weather. But what really sets it apart is the fact that it can be worn in many different ways. With just a slight adjustment one wardrobe staple can take on a completely new look from contemporary to classic or from day to night. Position it asymmetrically to one side, off one shoulder, V-neck, straight across the front, or twisted around your neck like a scarf. Pair these knits with everything from a pair of jeans and a T-shirt to a little black dress. Founded by Phil and Lihui Ke, a father/daughter duo, Kerisma is committed to designing knits that combine effortless style, great quality, and sensible cost. 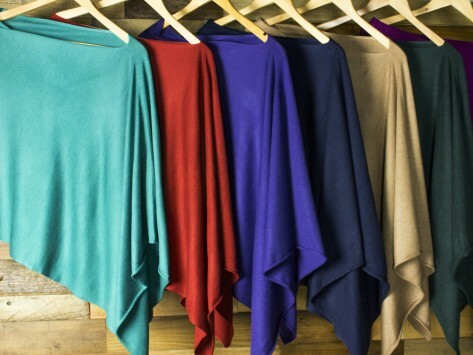 Available in a wide range of rich, vibrant colors, the Eden Poncho and Karyn Wrap give you the look of luxury without the high price. We won’t tell, if you don’t.